The main effect of the dress was the “lightning” effect which it triggered by the proximity of the wearers partner, using a magnetic switch. 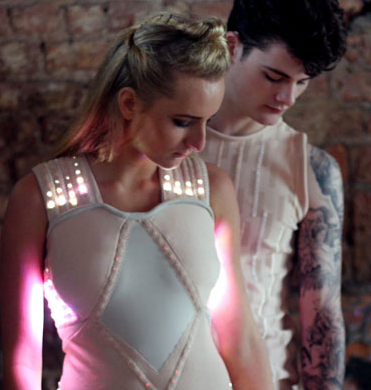 The patterns are generate by an Intel Edison compute module, which are fed to two Fadecandy boards in order to drive the 700 LEDS in the dress. There’s also about 60 metres of wire, 7 Lithium Polymer batteries, plus numerous connectors, all neatly hidden away in the garment. Here’s a video of the final night of the series of workshops. We held a launch event at which we had approximately 80 people attend the reveal of the dress. It was held in the Fablab in Limerick. The team was made up of myself, Lucia Poliakova, Mariel Mazan Palacios, Ivor O’Shea, Miia Satama, Vlado Turcan, Marie Danagher, Vlado Turcan, Dara Walsh, Elizabeth Poliakova, Stephen O’Shea plus about 15 others who joined us along the way for several of our 16 workshops. Here’s a selection of videos by Vlado & Lucia showing some aspects of the construction.